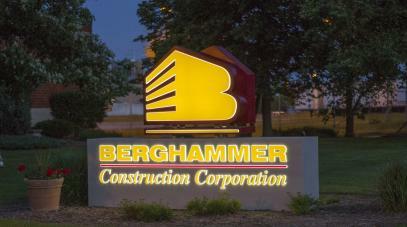 Monument signs are very popular among companies that want their brand and their facility to stand out from the crowd. They give a strong impression and offer a lot of creative opportunities. 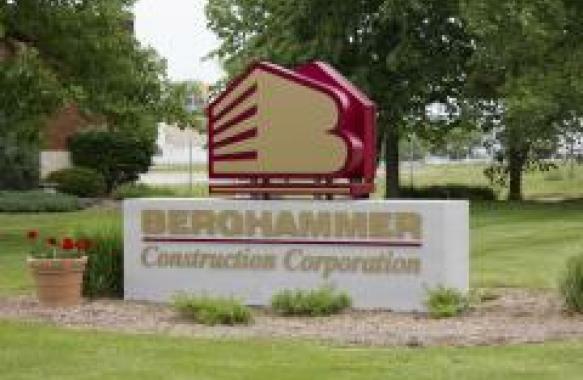 The monument sign we built and installed for Berghammer Construction Corporation at their headquarters in Butler, Wisconsin is a great example. 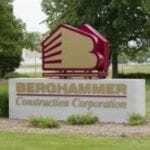 They had an existing sign that was several decades old and were excited to have a new sign built with a new look. And thanks to them for this very cool time lapse video of our crew installing the new sign. To get things started on this 7’ H x 11’ W monument sign, we first we did a survey of the existing sign. We were able to utilize the existing footing and foundation. We also submitted the design to the town of Butler for approval, had several rounds of design reviews and collaborated with the customer on determining colors and finishes for final paint and light source decisions. The next step was to develop our mechanical drawings for shop production. At this point, we dotted all of the I’s and crossed all of the T’s. Then we fabricated the cabinet and the push through sign faces are CNC machined on our Gerber 408 router. The letters were cut out of an aluminum panel and then ¾” clear acrylic was milled to fit into each letter opening. This adds architectural depth. Once we completed the welding of the aluminum frames and the cabinet was wired with LED’s, the sign was then painted and made ready for final assembly before shipping over to the site. 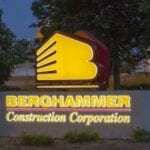 Installers first removed the existing sign and prepped the existing steel structure for the new sign.